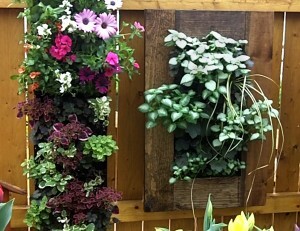 Vertical gardens are a great way to add color to a fence or wall. They’re terrific if you don’t have much space for gardening. With vertical gardening, you could install an herb garden right outside your kitchen door, and vertical gardens can be used inside, too. The trick to the vertical garden is the container. It’s basically a shallow box divided into smaller cells. 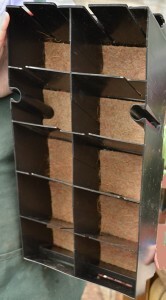 Each cell has a slanted bottom that keeps the soil and plant in place.You can buy the containers at at Mischler’s Florist and Greenhouses, 118 South Forest Rd., Williamsville. In the video below, Colleen Morrissey, herb manager and container designer at Mischler’s, shows us how to plant and install a vertical garden. To fill your vertical garden, you can take advantage of Mischler’s yearly perennial sale starting April 20. Perennials are 45¢ each (sold in four-packs only at $1.80). More than 75 varieties will be available. Of course, you can use these plants in other container gardens as well as in flower beds. Even though the sale is held early in spring, you don’t have to bring the sale perennials inside. They have been hardened off, which means they were introduced to colder temperatures several weeks ago. The plants are hardy to our zone, but all young plants are susceptible to frost damage. If there are frost or freeze warnings, cover your plants with a blanket or bring them into a protected area under a porch or in an unheated garage. Mischler’s suggests getting the plants in the ground as soon as you can work the soil. The sooner the plants are in the ground the sooner they can establish a substantial root system. Check out the video to find out how to plant and install a vertical garden. What a great idea. Has anyone gone through a season with this system. I’m wondering what the watering requirements are. When I had a vertical planting system made of a plastic bag, I was not able to keep it alive since it dried out so quickly. This one is beautiful and I especially like the idea of using it for herbs. @ Linda, the watering requirements are similar to potted garden plants, and dependent on conditions/plant selection, and regularity of watering. It will be necessary to water on a regular/daily basis. You can install the trickler resevoir which will give you a little edge on frequency, if not, it will be helpful to watch how your plants respond to conditions in your location. Another idea is to focus on xeric plants. Great idea and looks pretty. I prefer the drought tolerant plants like colorful sedums to reduce watering though. European wall displays come stateside! 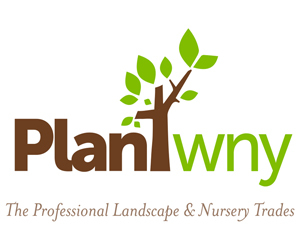 @ Anton…I am just seeing your inquiry about purchasing vertical garden supplies. We do still have them available and could certainly ship to you. Call Mischler’s at 716-632-1290 and ask for Colleen, Mark or Dan, for further details!